We have good days. We have bad days. Our air, too, has its ups and downs. 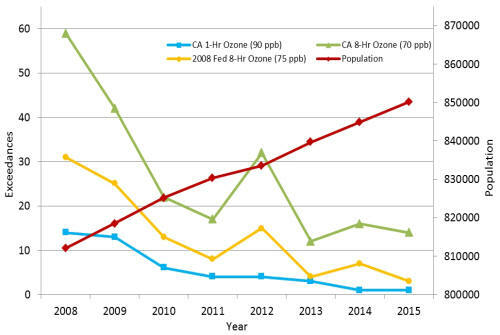 Over the years, though, the Ventura County Air Pollution Control District has made positive strides in improving our air quality, even with a jump in population growth. Still our air exceeds both the state and federal air quality standards for ozone and the state standard for particulate matter 10 micrometers in diameter and smaller (PM10). Where does air pollution come from? Emissions from motor vehicles, for example, account for more than half of Ventura County's air pollution. Other pollution sources include business, industry, agriculture, fires, and household products. Smog Season - Mission Impossible 2? Ozone, the main ingredient of smog, even at low levels, can cause a number of respiratory problems. Several groups of people are particularly sensitive to ozone - - especially when they are active outdoors - - because physical activity causes people to breathe faster and more deeply. Active children are the group at highest risk from ozone exposure. Active adults of all ages and people with asthma or other respiratory diseases are also at risk from ground-level ozone. And, even though scientists don’t yet know why, some healthy people may experience health effects at more moderate levels of outdoor exertion or at lower ozone levels than the average person. EPA’s AirNow site gives daily air quality forecasts for Ventura County and the rest of the nation. You can also find a wealth of information about air pollution and how it affects you. Additional air quality resources are also available. ARB’s Air Quality and Meteorological Information System (AQMIS) Internet site is a web-based source for real-time (and historical) air quality and meteorological data. AQMIS is used by state and local officials and the public to track air quality. It also supports smoke management and air pollution forecasting.